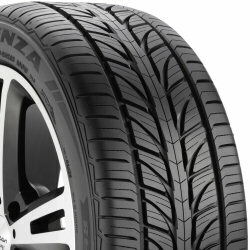 Developed for sports cars and performance sedans, Bridgestone's top of the line UHP all-season tire - the Potenza RE970AS Pole Position is intended for drivers that want high-speed capability and performance handling along with all-season traction. The stylish yet functional directional tread pattern is designed for predictable handling and performance on both wet and dry roads while also providing traction in light snow. Two wide, circumferential grooves along with numerous lateral grooves allow for effective water drainage from the contact area to help minimize hydroplaning. A tread compound formulated with silica further enhances wet traction. The Potenza RE970AS PP tread pattern features tread blocks which are designed to provide uniform contact pressure, thereby improving handling, ride comfort, and treadwear. Advanced 3D sipes and block design contribute to tread element stability for improved response and braking control while also providing biting edges for enhanced all-season performance. A continuous center rib helps to improve steering response and high-speed stability. Spirally-wrapped nylon over twin steel belt construction helps the Potenza RE970 AS to maintain its roundness at high speeds while the hard sidewall filler lends stiffness and minimizes distortion under cornering loads. M+S rated for all-season versatility. 40,000 mile limited treadwear warranty (see manufacturer's website for details). The Bridgestone Potenza RE970AS Pole Position is available in 16 through 20 inch rim diameters and 55 through 30 series aspect ratios.